Image caption Przemyslaw Golimowski was killed in a "mission of revenge"
Five men have been convicted of killing a drug dealer in front of his girlfriend with knives and a golf club. Przemyslaw Golimowski, 30, was attacked at his flat in St Mary's Street, Bedford, on 28 September in a "mission of revenge" for a previous assault. Three men were found guilty of murder, while two other men were convicted of manslaughter. 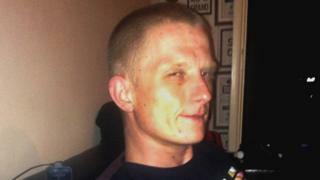 The five defendants will be sentenced by Judge Richard Foster at Luton Crown Court on Tuesday. During the trial, Mr Golimowski's girlfriend Anna Swierczynska told the jury she was woken at about 02:00 BST by "voices" in the flat's kitchen, so woke her boyfriend. It was told he got up to see what was going on and found a gang wearing hoodies. "They just attacked him with knives. I saw blood dripping off him," said Ms Swierczynska. She ran out to the corridor to seek help. An ambulance crew arrived but Mr Golimowski was pronounced dead at the scene. The trial heard Mr Golimowski and another man had "beaten up" one of the guilty men, Delpierro Mothersill, the day before, leaving him in a "pure rage". He then plotted a "mission of revenge", the court heard. Mothersill, 20, of Salcombe Close, Bedford; Taleb Hussain, 31, of Park Road, Sparkhill, Birmingham, and Damien Rooney, 25, of Magpie Gardens, Wixams, Bedford, were convicted of murder by a jury majority of 11 to 1. Jamal Jeng, 21, of The Close, Clapham, and Philip Mendy, 23, of Russet Close, Bedford, were cleared of murder but convicted of manslaughter. Det Ch Insp Adam Gallop, of Bedfordshire Police, said: "These five men broke in to Przemyslaw Golimowski's home with murderous intent, with seemingly no regard for the value of human life. "Anyone as cold and calculating as that should have no place in civilised society. I am glad our investigation has led to their conviction." Experts from the so-called Five Eyes intelligence agencies are to make a joint appearance for the first time.